The former Albury Hotel is located on the corner of Oxford Street and Barcom Avenue, in the inner city suburb of Paddington. 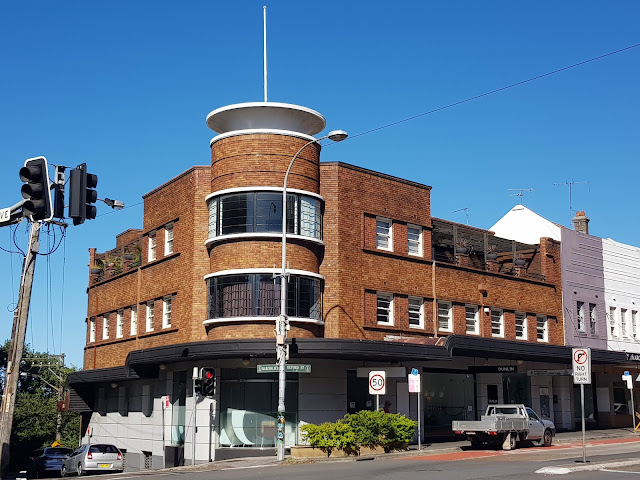 It was built in the Inter-War Art Deco architectural style and was a pub until 2000. It is now used as a showroom for home furnishings. That is a marvelous building. I certainly remember it as an operating hotel and great fun was had there. Great architectural design. Goodness... how I love Deco for corner pubs! Looks like a great place to have stayed at one time. The folks with the home furnishings store probably would not appreciate that these days. I'm glad when buildings can be repurposed instead of torn down.